The multipurpose Himmelstalundshallen indoor arena in Norrköping, Sweden, which is home to the HC Vita Hasten ice hockey team, has installed a Crown DCi Series Network amplifier as part of an audio system revamp. The 4,480-seat facility also hosts concerts and other sporting events. Sound contractor Micab under the direction of installation specialist Mikael Bergvall, handled the new audio installation. The arena has become the largest in Sweden to install Harmans’s Crown DCi Series Network amplifiers. “In addition to providing clear, intelligible audio we needed to achieve a system that provided equal coverage at every seating area,” said Bergvall. Working with Christer Lidberg and Jan Hedlund at Swedish Harman distributor Septon Electronics, a system was designed based around eight Crown DCi 4|600N and eight DCi 4|300N networkable power amplifiers. The amplifiers are linked together using BSS Audio Soundweb London BLU-101 and BLU-160 devices with BLU-Link. Twenty JBL AM5215 loudspeakers complete the installation. 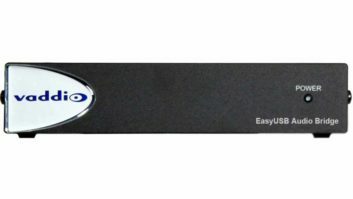 The DCi Network amplifiers offer networked monitoring and control via Harman HiQnet Audio Architect system software, and digital audio connectivity using the Harman’s proprietary BLU link as well as analog inputs. In addition to the main system, a Crown ComTech DriveCore CT8150 amplifier is used to power the speakers in the spectator’s entrance. The JBL AM5215 loudspeakers are hung equidistant around the perimeter of the arena and aimed into the seats, a configuration that directs the output of the loudspeakers to the seating areas while minimising reflected sound from the walls and ceiling along with any gaps or overlaps in coverage. The two-way AM5215 employs a 15-inch woofer and a waveguide that can be rotated horizontally or vertically to facilitate installation in a wider variety of applications. “The system really came together well and more than met the arena manager’s expectations,” said Bergvall. He noted that the support from Harman and Septon was “critical” in ensuring that the system’s components all worked together seamlessly and delivered optimum performance. “The quality of the sound in the Himmelstadlundshallen has been completely transformed. Everyone in every seat now enjoys clear, full range reproduction for game announcements, music and audio.” The memory of the previous sound system is now just a fading echo.